Good design is a crucial part of building good public services. Good design affects many things -- it’s about more than just typefaces on a website. We have many tools to help us design good services. We have design principles, the service manual, the service standard and assessments to maintain standards - all things that help the Government meet user needs by building the right things in the right way. Another way of trying to make sure we meet users needs is training the people who make these services. To help do this we’ve started to run cross-governmental design training. These courses help people find out how design works in building government services. They are open to designers across government and anyone else who wants to understand more about design, how to work with designers or become a designer in the future. 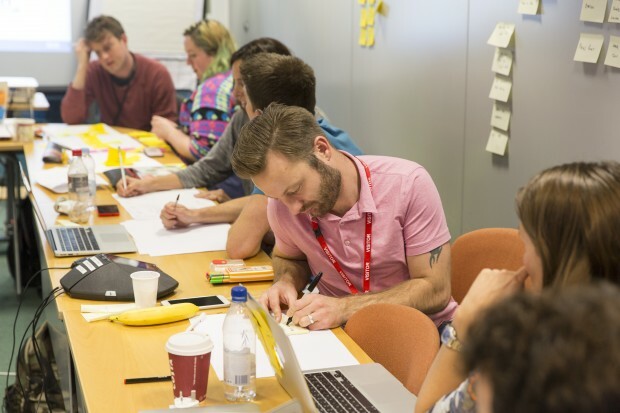 GDS design training is all about trying to make sure people throughout Government who are designing services have the knowledge, skills and support they need to make sure our services meet user needs and are the best they can be. The seeds of a user need emerged in the summer of 2014. I was working as a service and interaction designer for the GDS on the Land Registry concept and alpha. My colleagues were fantastic people who knew lots about the Land Registry and how they build digital products. What they weren’t so confident with was research and design and the ‘user first’ way of creating services. They wanted to know more about how design and research is used to make public services, what good design looks like and how to do it. I ran lots of training sessions in my old job at a user experience consultancy so it seemed natural to set up some training sessions. I ran the first version of the course myself. It introduced different methods and tools in user-centred research and design. It was light on theory; heavy on practical exercises. Attendees were a mixture of people who either were doing a research or design role or who wanted to move into the area. After positive feedback, we decided to run some more. Between October 2014 and June 2015 we ran eight user-centred research and design training courses with approximately 90 attendees in total. We’ve held courses in Glasgow, Coventry, Croydon, and London with attendees from the Environment Agency, the Student Loans Company, the Insolvency Service as well as colleagues from within GDS. Attendees come from lots of different disciplines. Some are business analysts, others are developers. User researchers and apprentices have also come, as have experienced designers who want to get a sense of how we do design in government. In September and November 2015 and January and March 2016 we refined the program to three days of design training delivered by a group of experience practitioners. We’ve had a total of 85 people attend training with presentations from Tim Paul, Stephen McCarthy, Louise Downe, Caroline Jarrett, Alistair Duggin, Persis Howe, Chris Heathcote and other members of the research and design community. “I particularly enjoyed having the opportunity to play with the prototyping toolkit and get over some of my fears of touching code”. “It's good for a user researcher to have a few tricks up your sleeve so you can create a fast and early prototype without being dependent on a designer”. The training is also heavily oversubscribed. In November we released 50 places for courses in January and March 2016. Both courses were full within the week. We had 130 people register for a place, so unfortunately we had to turn some people away. We will be running more in the future. In the early days I sent out a feedback survey after the training, but the completion rate was so low it was hard to tell what was useful. Recently we’ve started started doing mini retrospectives at the end of the three days of training, which is much better. What we’d really like to do is to have a user researcher to call up the participants to get more detailed feedback. If you have suggestions on what training you think would be useful, please get in touch. The next training will take place in early May. If you design government services, you can subscribe to the Digital Service Designer’s mailing list to get more information about the course. Neither the course nor the mailing list are open to the public. Further GDS design training courses this year will be organised by my design team colleagues as I’ll be on maternity leave. Thanks Ingrid, that's definitely something we're hoping to do in future! Hi, I've just joined the group. As a Customer Insight Mananger in Government I want to increase my skills in this area. Do you know the dates the course will run in May please? Hi Carole, I'm afraid the May training was all booked up some time ago. The next one will be in about 5 weeks. We announce them on our <a href="https://groups.google.com/a/digital.cabinet-office.gov.uk/forum/#!forum/digital-service-designers">designers mailing list</a> if you'd like to sign up.